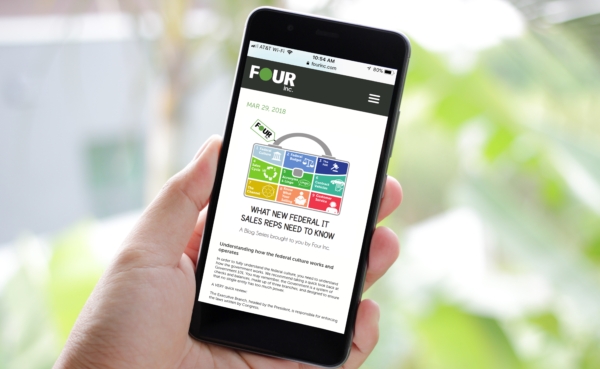 Welcome to the new Four Inc. blog! Your permanent home for all things IT. Over the next several weeks, we’re going to be sharing our thoughts on what new federal IT sales reps, like you, need to know about the industry and some practical tips we think will give you a jump start in your new role. Effective on November 8, 2017, Army Contracting Command - Rock Island modified the Information Technology Enterprise Solutions - Software (ITES-SW) contract to increase the contract ceiling by $130m, from $49m to $179m. ​Four Inc. is pleased to announce recognition by Washington Technology on its Top 25 8(a) Firms Report. Bloomberg Government released the sixth annual report of the top 200 Federal Industry Leaders (BGOV200) in 2017 and Four Inc. ranked 191. Four Inc. Sponsored LLS Man of the Year! Every year the Leukemia and Lymphoma Society hosts a Man & Woman of the Year (MWOY) campaign, a spirited fundraising competition across the U.S. in which participants build fundraising teams to compete for the title of Man or Woman of the Year. Four Inc. is pleased to announce recognition by Washington Technology on its Top 100 Report, which highlights the largest government contractors based on their prime contracts in IT, systems integration, professional services and telecommunications.